Phiona (aka @RareNotions) challenged me this week to try a craft I’d never even heard of: Kumihimo. Any idea what it is? After googling, I found out. Kumihimo is the Japanese craft – so many of my favourite crafts are Japanese aren’t they? – of braiding. The resultant braids are used as ties for jackets and obi – they were once used by samurai as a decorative way to lace their armour. As I near the end of my 52 weeks I’m trying to save some money and not buy new equipment for every craft so I was keen to find a DIY alternative to the braiding disc recommended. 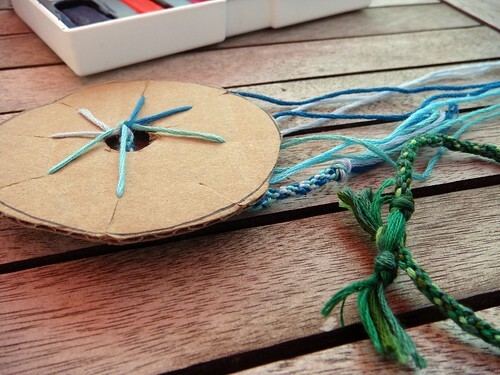 Luckily, I found this great instructable which shows how to make a braiding disc from cardboard. Armed with my disc and some embroidery thread (I bought a job lot years ago and it’s not the best quality so I’m really happy to have found a craft to use it up with!) I got going. 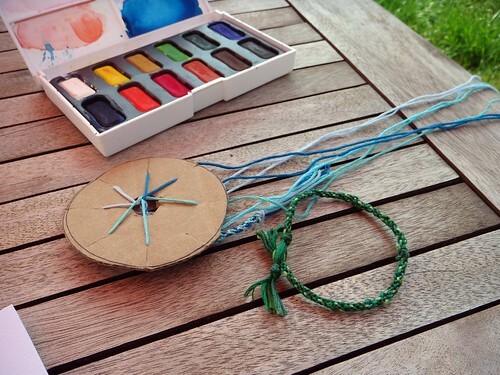 Once you’re into the rhythm it’s a really soothing and relaxing craft – perfect for doing outside while enjoying the sun or watching TV. 1) Cut a circle out of sturdy carboard. Cut 8 slots in it and a hole in the middle. 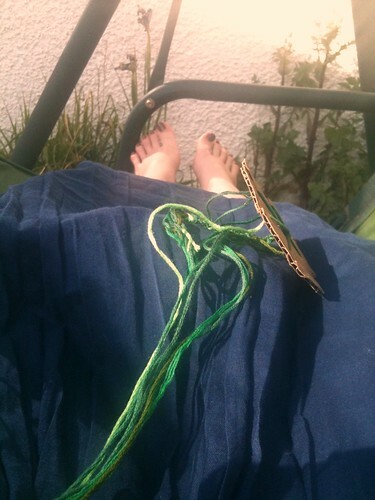 2) Cut 7 lengths of thread (or yarn) – about finger-tips to elbow is enough for a friendship bracelet I think. I’m not one for measuring things. 3) Tie your threads together at one end. Put them through the hole in the card so the knot is just sitting inside. Slide one thread into each slot – make sure it’s all tight. 4) Turn the disc so the spare slot is at the top. Take the third thread from the spare (clockwise) over the top of the other two threads and put into the slot. 5) Turn the disc so the new spare slot is at the top – count three round to the right again and move that thread to the spare slot. 6) Keep going until you get the length you want. Video man says 20 minutes but it takes me longer than that. Although I am easily distracted. 7) Unhook all the thread and tie it off with a knot at the end of the braided thread. Tie another knot about a centimetre along. Cut of the excess thread. To close the bracelet, thread the knot from the starting end through the threads between the two finishing knots. If any of the instructions are hard to follow, I highly recommend the video. Have you tried kumihimo? What other uses have you found for the braids other than lacing your armour of course? Thanks so much for this! I’d never heard of kumihimo before but after reading this I had a go and am now slightly addicted! I’ve been using varigated perle 5 threads and have made several bracelets for myself (and a couple for my 8yr old son too!) I love trying out new crafts – especially ones that are so easy! So pleased you had a go! It’s pretty addictive when you get going isn’t it? I wish I had found your blog sooner, the concept i brilliant and I wish I had found you in week 1 instead of week 45! I guess i shall just have to read all your old posts! Will certainly try this kumihimo, I have lots of spare thread knocking anout and, like you, like crafts where you don’t have to buy equipment to do it. I was trawling through the internet looking for a new craft to try and found this blog post on Kumihimo. Sounds easy to pick up and hard to put down. Just the sort of craft I like!